The hike to the summit!!! 11:30pm rolled around and our wake up call came. I proceeded to climb out of my sleeping bag and into the blistering cold tent. Luckily I had slept in my base layers, so that helped make the process a little more bearable. Lasse and I started to layer up and get our backpacks all packed up, during which our excitement was slowly building. Finally crawling out of the tent, we made our way to meet the rest of our group and have some tea and cookies. Since both Lasse and I enjoy food a lot and knew we would be burning a lot of calories over the next few hours, we convinced Salim to provide us with some bread. This was good because I knew I had to load up on more than cookies and tea to help me through this journey. So naturally, I made myself a couple peanut butter and honey sandwiches. 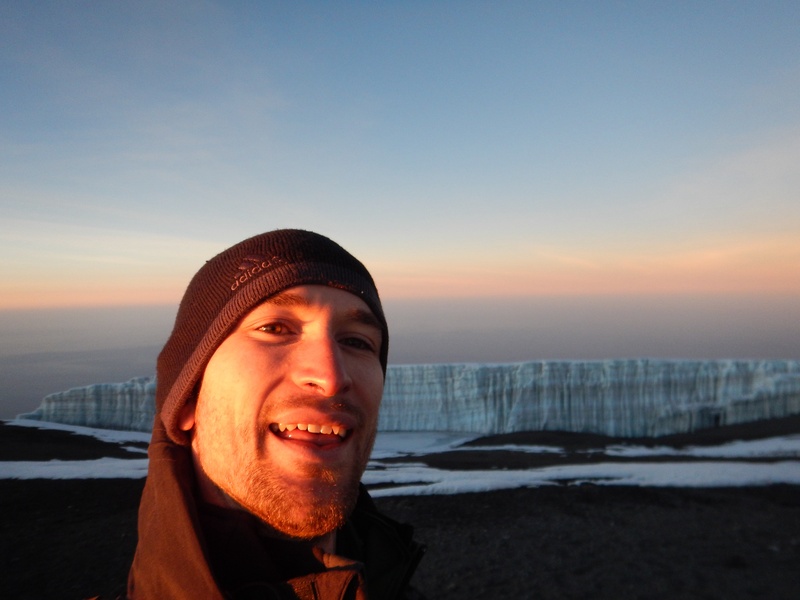 Raoul had left camp earlier in the night which left Jose, William, Lasse, and myself to hike as a group together. 12:30am approached and we were ready to leave. I decided to make a last ditch effort and leave behind a big bulky jacket that I had thought would be a good idea to rent. With the remaining layers I had, I knew I could keep warm without it and plus I would have more mobility without wearing that thing. Lasse on the other hand decided to wear his and bring it along. Leaving camp, there was 7 of us total in our group. As we started hiking up the mountain very slowly, you could see all of the other groups with their headlamps already on their way. We were yet again one of the very last groups to leave. 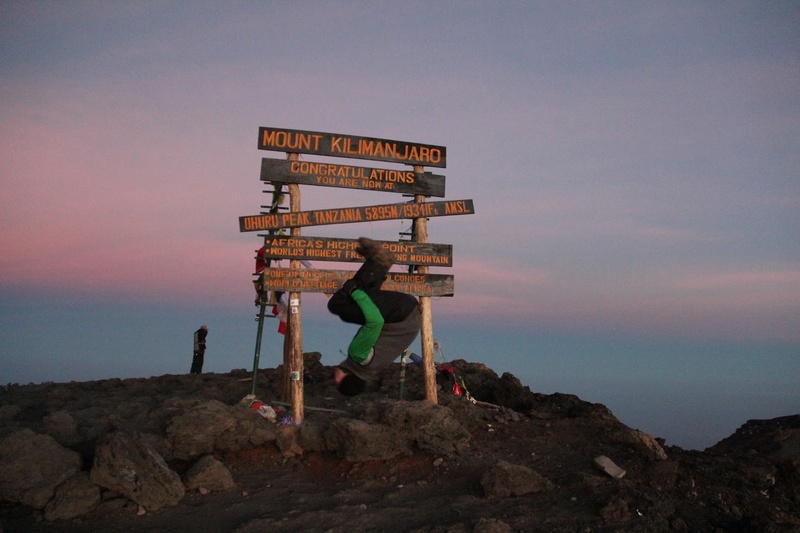 Considering Salim had climbed the mountain more than 100 times, we trusted he knew how much time we would need to make it to the summit by sunrise at 6am. 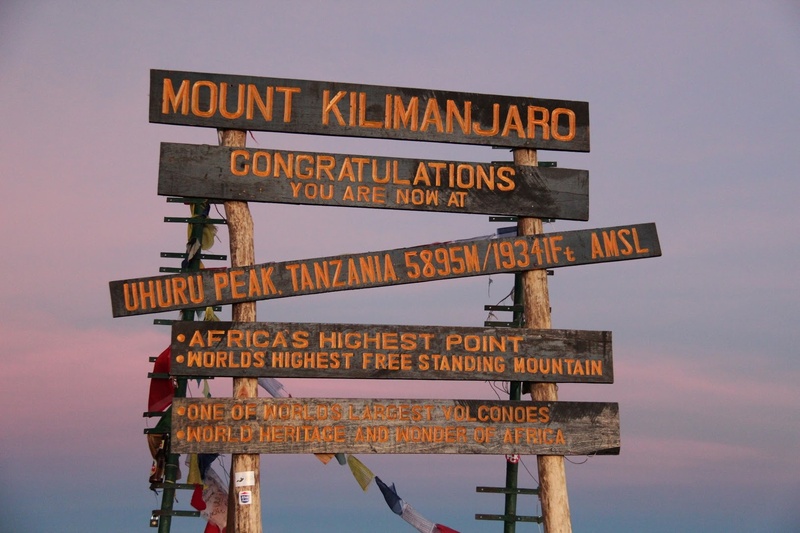 So started our journey to Uhuru Peak, the Roof of Africa!!! 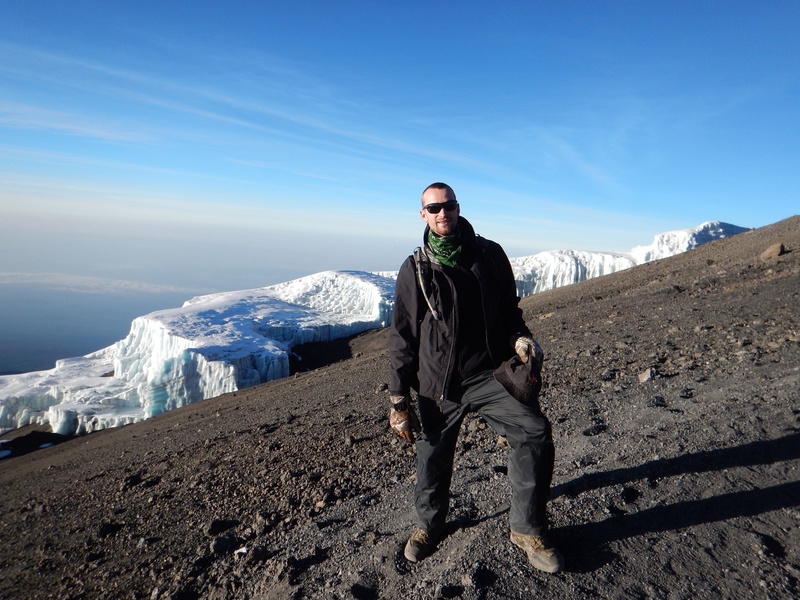 With base camp located 4693m (15,269ft) we had a 5km (3mi) ascent to the top of Kilimanjaro sitting at a massive 5895m (19,341ft)!!!!! This was a huge elevation gain of 1202m (4,072ft). Yep, we would be hiking straight up. Part of the reasoning behind starting the hike at night, is so you don’t realize how steep the terrain is. Also in the morning the peak is clear and it is a lot less likely to be cloudy. Our pace up the mountain was especially ‘pole pole’ on this cold dark night. Take a step pause, take another small step. With our group going at such a slow pace, it was a surprise as we started over taking groups that had left before us. As we were hiking, Lasse and I were not about to keep quiet, so we started talking and laughing and quoting movies for most of the hike up to Stella Point (false summit about an hour from the top). This helped lighten the mood for us since everyone else seemed pretty quiet and focused on hiking, especially the other groups that we were passing. Our enjoyment of the hike caught on and before we knew it, our guide Salim was singing songs at the top of his lungs that ranged from Bob Marley to some local Swahili tunes. This made the brutal slow going hike better, but unfortunately just like everything else some groups didn’t appreciate our enthusiasm and told us to shut it. Well we didn’t listen to them and just continued to have ourselves a good hike. On the other, had some of the other groups enjoyed the singing and their guides started to chime in off in the distance up the mountain. About every hour, we would stop for a quick snack and drink break. This would last no longer than 5 minutes because it was so cold and we needed to keep going to stay warm. As the hike progressed, my camelback hose froze even with me blowing air back into the bladder. Luckily, Lasse had let me borrow one of his Nalgene bottles which stayed relatively unfrozen throughout the hike. About an hour from Stella Point, we still had not seen Raoul which was a great sign and meant he was still feeling good and hiking. Unfortunately for our group, Jose got really tired and needed to rest and William caught a bug at the worst time possible. After sitting around for about 5 min I could feel the cold start creeping in, so I told Salim I needed to start hiking again to stay warm. Lasse and I carried on with our waiter, Salim, as our guide. Being about 5ft tall he was a fast little guy and started climbing up the mountain like there was no tomorrow. So much for ‘pole pole’ and both Lasse and I kept up with him. After about 15 min, I realized how fast we were going and had to slow down because I was not about to get elevation sickness and needed to keep my heart rate down. Well we were not far from Stella Point and made it up there at 4:45am!! 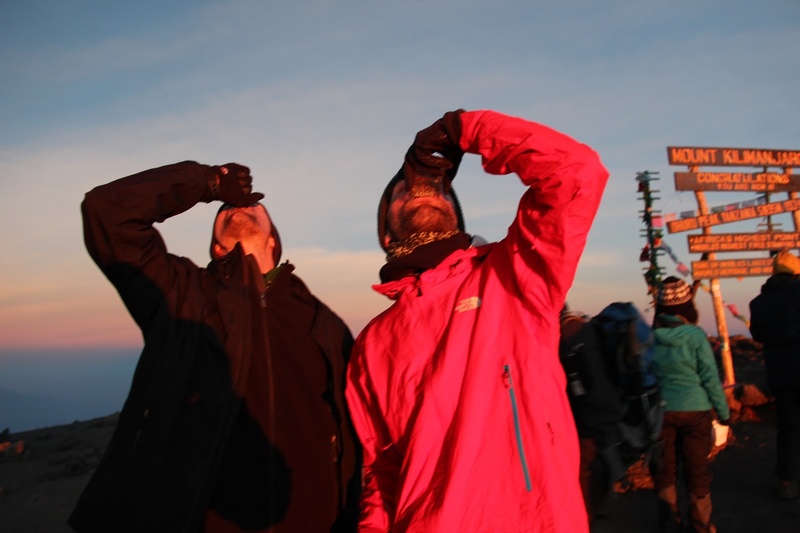 We had successfully passed every group on the way and reaching the top, there was none other than Raoul and Stephen! They had arrived about 10 minutes before us. With it being this early, Lasse and I did not want to start hiking to the peak since it was only a 45min hike and we would get there way too early before sunrise. I didn’t want to sit down and relax because with the weather being so cold, it would instantly cool us down. This is where Lasse came to the rescue, he had his phone and started playing music! We started dancing around having a jolly good time yet again, while some French hikers, who didn’t look to be doing too well, just looked at us like we had gone crazy. After about 15 minutes, 5am was upon us and we decided to slowly make our way to the top hoping the rest of the group would catch up. Even though we started hiking again the party didn’t stop and with the ground being a little flatter, we kept on dancing and singing all the way to the peak. Stephen would just look at us and laughingly say he’s never seen anyone like this in the 10 years he’d been hiking the mountain. Regardless, it worked and both of us stayed warm and had a great time finishing the hike to the summit! 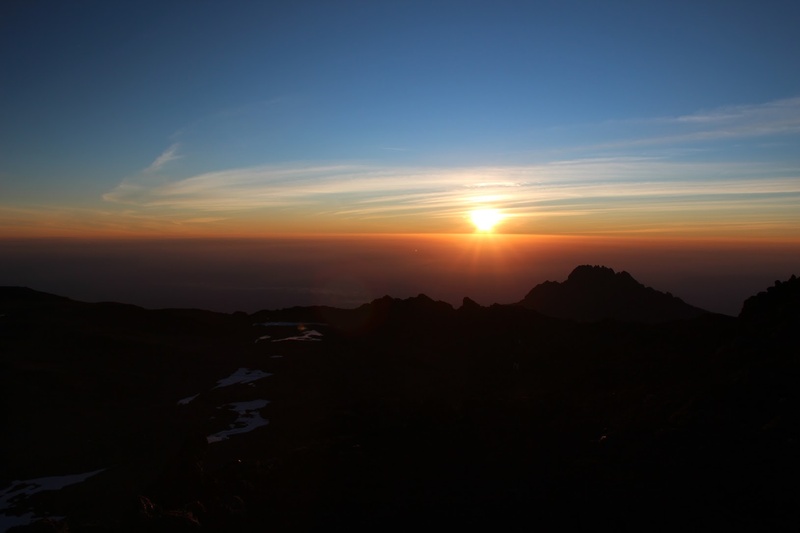 As we were approaching the summit, the sun started to rise. It was one of the best sunrises I have seen. 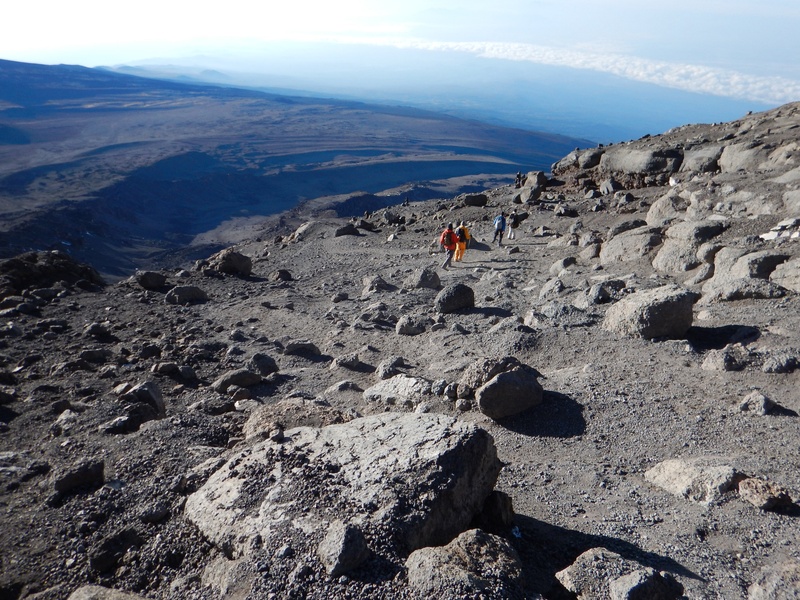 We were able to walk slow enough for the home stretch to the summit that the rest of the group caught up. Summiting at 5:50am we were one of the first groups up! This gave us time to enjoy the sunrise, capture some great pictures, and freeze our hands. We stayed on the summit enjoying our victory for about half an hour before starting to descend. 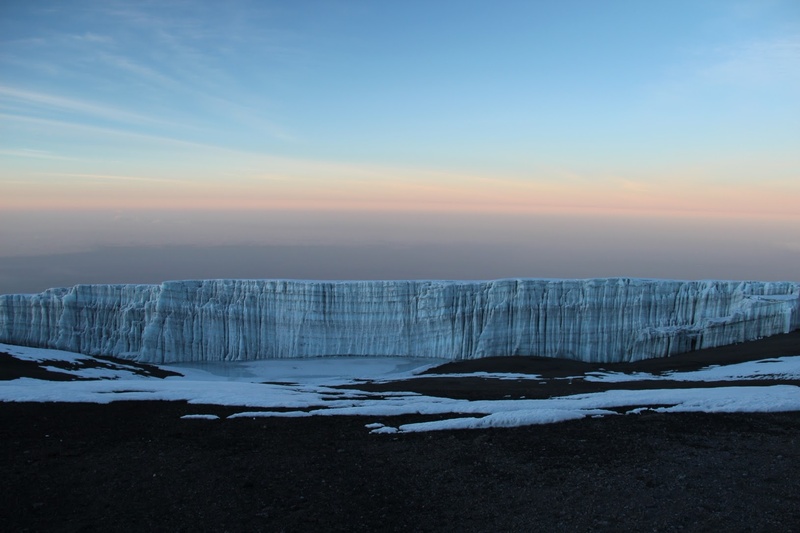 The timing of making it to the top of Kilimanjaro could not have been better. 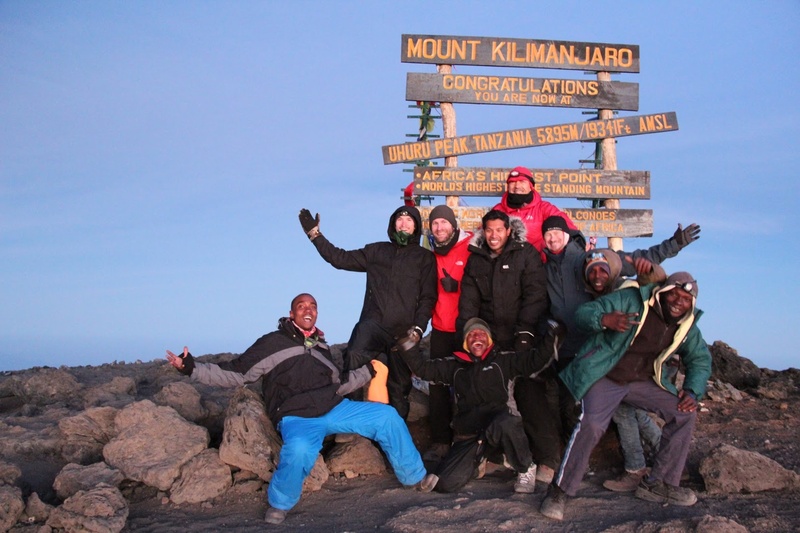 Kilimanjaro, Africa’s tallest mountain had been conquered!! 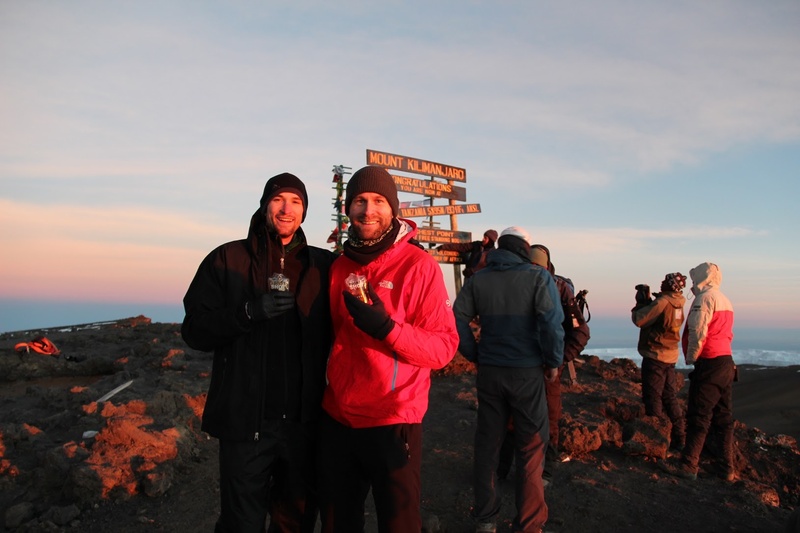 Lasse made sure to provide us with a little celebration drink upon accomplishing this huge feat! It was about a 5 1/2 hour hike up. Going down however only took 2 hours. As we were descending, there were numerous people that we saw struggling to make it to the summit. One lady about 3km from the top sat down and looked like she was about to pass out from exhaustion. Her friends however wanted to make it to the summit so they picked her up and half carried her the rest of the way. Walking down was worse than the hike up. It was so steep and loose! This hike was just brutal on the knees and we couldn’t wait to make it back to base camp. Arriving back at base camp at 8:30 am we had a couple hours before we needed to be all packed up and out of there. Some good food was in order to begin with before we even thought about hiking again. 11am came and it was time to keep making our decent down. No rest for the weary. 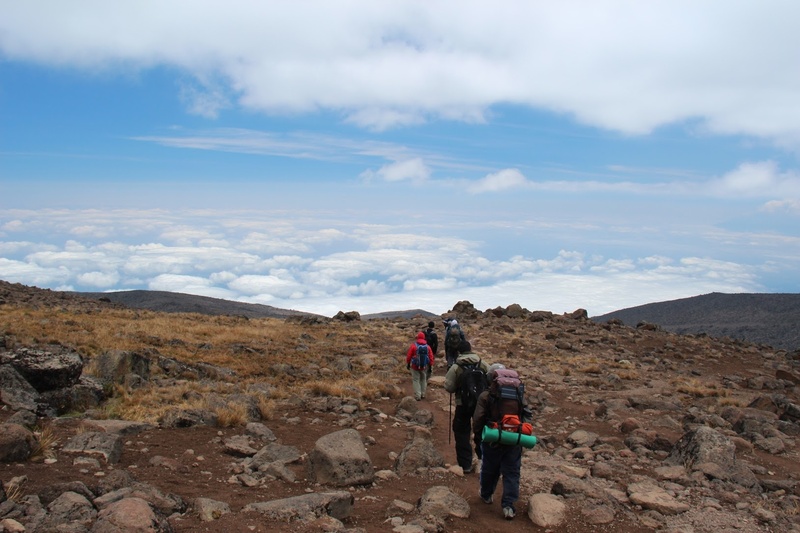 We had a 3 hour hike to Mweka Camp which sat at 3099m (10,157ft). This was a total descent of 1594m (5,229ft) of knee aching hiking. Once we arrived at camp it was such a relief. It was finally time to relax, eat some food, and reflect on such a great journey! Even with us being so tired we stayed up until 8:30 talking about the great hike we had just accomplished. Tonight we were going to sleep great!! Yeah, Riley! Show ’em how it’s done!